A KEY player behind claims a picture of a ‘dead alien found in a crashed UFO in 1947’ had been found has sensationally admitted it WAS actually of a mummified boy. ‘irrefutable smoking-gun evidence’ of the Roswell legend which would change history. But sceptics and even alien investigators quickly slammed the event suggesting the picture in fact showed a mummified child in a museum exhibit. ‘Roswell hoax’ when fake images alleging to show a secret US military autopsy on an alien corpse were released and later proved to be false. Now one of the key players in investigating the so-called ‘Roswell Slides’ who put his name to them being genuine snaps of a dead alien, has been forced into a public apology. 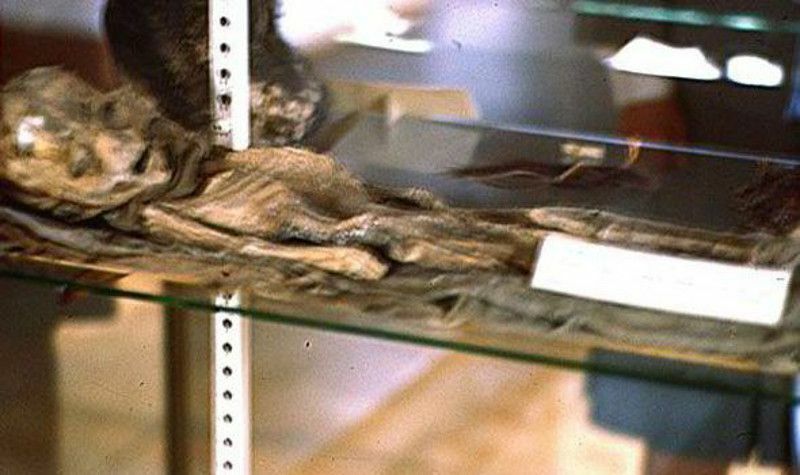 Tony Braglia, a world-leading UFO researcher, yesterday issued a statement saying it has been established the picture was of a Native American mummified child. He said: “I must offer my sincerest and deepest apologies to the Native American people of the Southwestern United States. It was a steep climbdown from comments he made before the unveiling when he insisted it came from outer space. He earlier said the ‘creature pictured’ is not a being ‘that finds its origin on Earth’. The Roswell myth is that the US military found an alien corpse in a crashed space craft on a remote ranch in the town in New Mexico, but kept it hidden from the public ever since. It has long been regarded as the world’s biggest alien mystery, since it first emerged after news reports at the time of a strange craft being found crashed. Sceptics say it has been proved it was a weather balloon that crashed and nothing more. The existence of the slides had been known among the international UFO community for a number of years. Sports journalist Adam Dew alleges he obtained them in around 2008 after they were found in a collection of 40 colour slides in the attic of a well-connected American couple when their property in Texas, was being cleared before sale. Mr Dew released a slick movie-style documentary trailer ahead of the release of the pictures, suggesting to be the story of his investigation into what the slides showed. He set up the company Slidebox Media to promote the film, which has yet to emerge in full following the conference. Express.co.uk has discovered the website for Slidebox Media is registered through privacy web hosting company Domains By Proxy, LLC, which is used by those wishing to avoid unsolicited contact from third parties and their personal details being made public. Mr Braglia said the error stemmed from a number of ‘extraordinarily incredible coincidences’ surrounding their discovery among the couple’s travel pictures. He insisted it was a well-meaning case of mistaken identity and not a hoax. Yesterday express.co.uk revealed that the ‘Be Witness’ event organiser Jamie Maussan had been linked to a string of outlandish alien hoaxes, in which others had produced alleged evidence of alien life being found, and he had investigated the cases and put his name to the fact they were genuine. We also reported how event organisers would have pulled in a minimum of £240,000 through ticket sales, with extra £15 fees to watch online, although Mr Maussan insists to have made a loss putting on the conference. The admission came after a group calling itself the Roswell Slides Research Group announced online it has received a higher resolution copy of the image, which it had used ‘debarring software’ on to try to decipher a card placard next to the body that had been illegible. They concluded the text on the card was: “MUMMIFIED BODY OF TWO YEAR OLD BOY. At the time of burial the body was clothed in a cotton shirt. Burial wrappings consisted of three small cotton blankets. Schmitt, Tom Carey, and Richard Dolan, put forward at an event held on May 5, 2015, in Mexico City, as proof positive of an extraterrestrial crash at Roswell in 1947 and the recovery and cover-up by the US government of alien bodies. These are claims that most of the aforementioned group have been making for over two years now. They have repeatedly said that the best experts they could find were examining the slides, and that they had determined the slides showed a creature that was of unearthly origin. “Nothing could be further from the truth. As many skeptics have been saying since the first rough image of one of the slides was procured several months ago as a screen capture from a promotional video released by Dew, the figure photographed and shown in the slides is almost certainly a mummified body. Mr Bragalia is the first of the promoters of the event to admit the error, and it is not clear if it was an intentional hoax, or those involved genuinely believed it to be a real alien which was photographed. Mr Dew has already suggested that the image of the deciphered placard has been ‘faked’. He released on his website Slideboxmedia, which is promoting the documentary, a different high-resolution scan of the placard and versions of it after going through the same software. He wrote: “The ‘Roswell Research Group’ claim to have de-blurred the placard but we have our doubts because we have been unable to replicate their results using the same software.